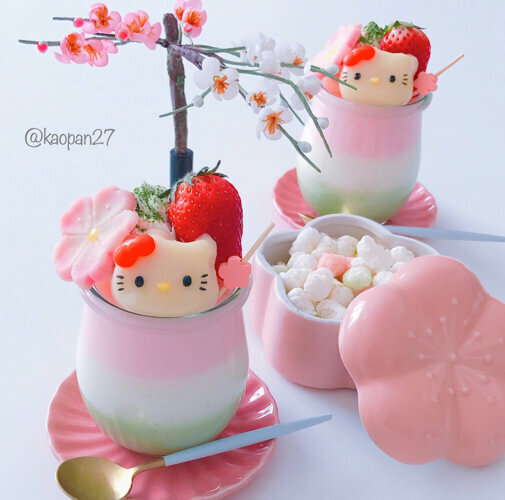 In this article, I will introduce to you how to make “KITTY Chan’s 3-layered milk pudding and a tofu shiratama (white ball) that does not get hard. ①Add sugar to the milk and heat it until the sugar melts. 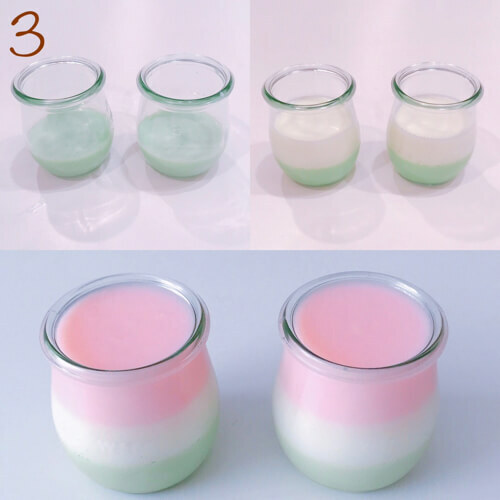 ②Soak gelatin in water (1 table spoon). ③Add ① to ② and heat it. 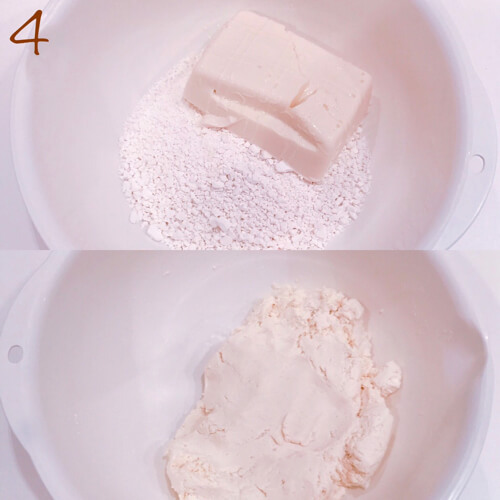 ④Separate ③ into 3 bowls. ⑤Add color to two of ④. Make one green by adding matcha and make the other pink by adding pick coloring. 3：Now, let’s make the layers. You need to firm-up the layers one at a time. The order of the layers should be – 1. Mattcha 2. Plain 3. Pink. First pour in the mattcha layer and firm-up this layer by leaving it in the frig for 30 minutes to 1 hour. Next, pour in the plain-colored layer and put this in the frig. In the same way pour in the pink layer. 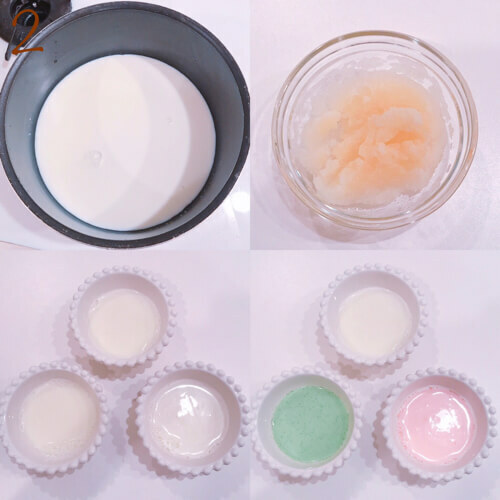 ☆Be careful not to pour the next layer on top of the previous layer too early. If you do, the layers will mix together and a well-defined 3-layer pudding will not be possible. ☆The shiratams you will make will not get hard since water is not used. ①Color some of the shiratamas red using color powder. ②Cutout the white shiratamas using KITTY Chan’s cutout. 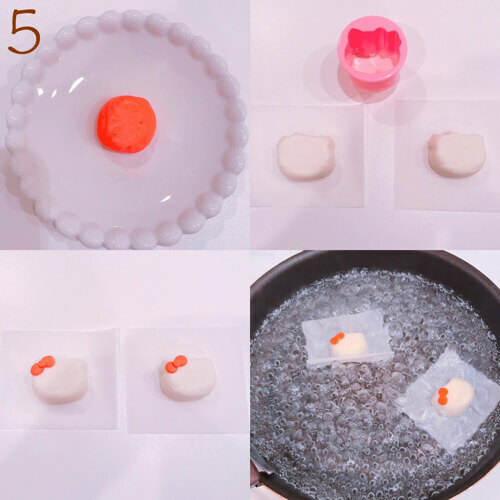 ④ Put the shiratamas on top of a cooking sheet and boil them. 6：Draw a face using a chocolate pen after the surfaces of the shiratamas are dried. 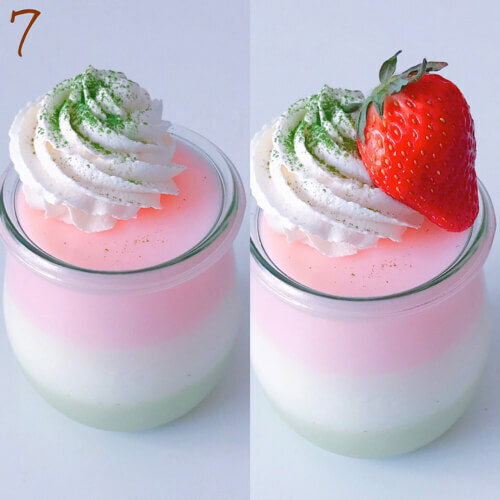 7：Top the milk pudding with fresh cream and sprinkle mattcha powder on top of it. 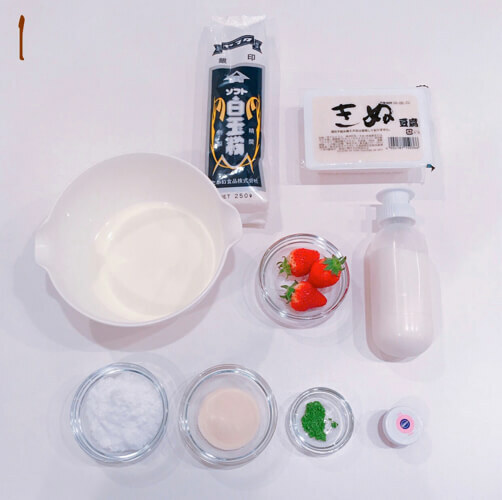 Decorate with strawberries and KITTY Chan’s shiratama and any other toppings that you like. 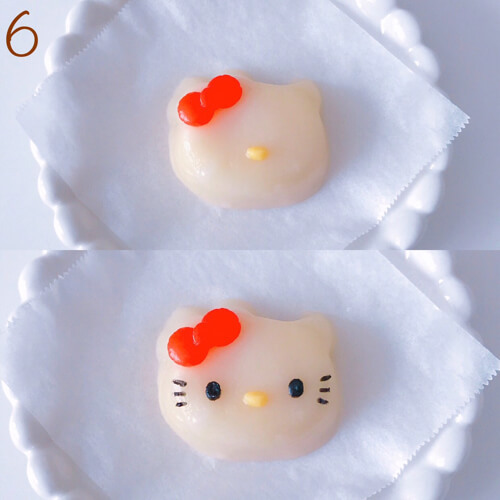 ☆This time, I used the cutout of cherry blossom dough.